I'm a Web & Graphic Designer with experience in many fields of design—user-centric Web development, product rendering and corporate image standards are among my areas of expertise. 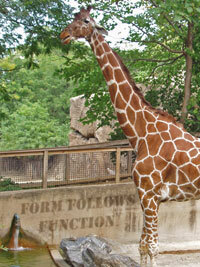 As a giraffe’s design is suited to its environment, your next web & graphic design can fit the marketplace. Careful consideration to the audience, clarifying the message, making data accessible and many more priorities are all part of my design process. I am available for freelance, contract and full-time positions. Contact me to discuss what I can do for you and your business.